Stainless steel wire in a plastic coating Fixing plate - Zinc alloy. 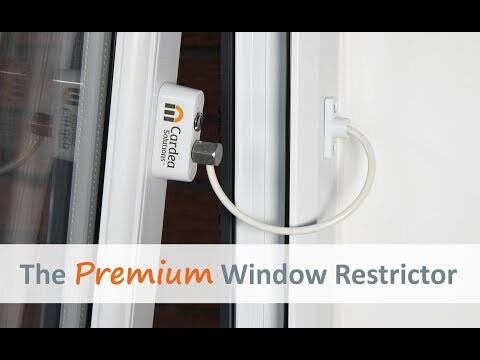 The Cardea Window Restrictor is designed to eliminate the risk of injury caused by falls from windows by restricting the opening of a window to only 10-15cm in line with HSE guidelines. Product feels solid. Using it for my child’s bedroom. item look good, thanks Seller...A highly recommended seller whom respond to my queries fast and fast delivery too. Thanks! Items received within 2 days after purchase. Nicely packed. Fast delivery and responsive vendor. If discount given will be great! Product is good too! Items received just in time. Have yet to install them. Chrome restrictor is now available, apologise for not update the quanity promptly. On 28th Nov, I have ordered 2 sets of window restrictors (Order No. 238270050), However, I haven't received consignment until today, can you please advice on shipping arrangement. Thanks. Can you check if you have the item in your Mailbox? The postman will be putting it in there. Meanwhile, I will check with Singpost why item is not delivered and status on their website is not updated. FYI, this is what I have send out. SingPost has advised that the package has been delivered to you on 4 Dec 17. Please check your mail box and confirmed that you have received it. If I am buying 4 units, can I have univeral keys for all 4 locks? The second is about the design of the bracket that mount to the window. I notice that the two screw head is exposed and not covered at all. Other brands are covered. Sorry for the late reply. Yes, the keys are universal for all 4 locks. Regards to your second question, the bracket that mount to the window is not covered. The important thing about restrictor is to ensure they are being tested and cerrified so that safety can be ensured. Some brand in the market may have nice covered but it does not have any certification to ensure it work the way it was designed. Do let me know if you have any further query. Many thanks for your interest in our product. Hi, is more than 1 key provided if i were to purchase multiple restrictors? Every restrictor come with single key and all restrictor's keys are the same so they all can open any restrictors. If you have a missing key and need a replacement, feel free to let us know and we can replace it for you free of charge. Hi, I ordered chrome color x 2, but I received brown color instead... Can you get in touch with me on the exchange of color please? Thanks. My apolgise for the wrong color send by my staff while I am oversea. Please let me make some arrangement for the exchange on Monday. Buyer no longer need a replacement as the restrictors has been installed. Thanks buyer for letting us know. Hi, when is the brown window restrictor available again? Hi Sir, it should be available next week. I will inform you once the stock is in. Thanks for your support. Brand New Heavy Duty PenKid Window Panel Restrictor. Local SG Stock and warranty ! !